4 million Bumbo Baby Seats are being recalled because they need a seat belt. Four million Bumbo Baby Seats are being recalled due to the risk of babies falling out of them, said the U.S. Consumer Product Safety Commission on Wednesday. But this doesn't mean that parents have to ship the seats back or throw them away. The company is encouraging consumers to order a repair kit that contains a restraint belt for the seat, available for free. "Consumers should immediately stop using the product until they order and install a free repair kit, which includes: a restraint belt with a warning label, installation instructions, safe use instructions and a new warning sticker," said the CPSC. "The belt should always be used when a child is placed in the seat." One million of the Bumbo Baby Seats were recalled for similar reasons five years ago. The government agency said there have been dozens of incidents since the October 2007 recall, which required that warnings be added about the risk of placing the baby seats on raised surfaces, like tables, chairs or countertops. But despite the warnings, 50 babies fell out of their seats "while they were being used on a raised surface," and 19 infants suffered skull fractures as a result. The South African company said that the seats are supposed to be used "on the floor with adult supervision and never on raised surfaces." 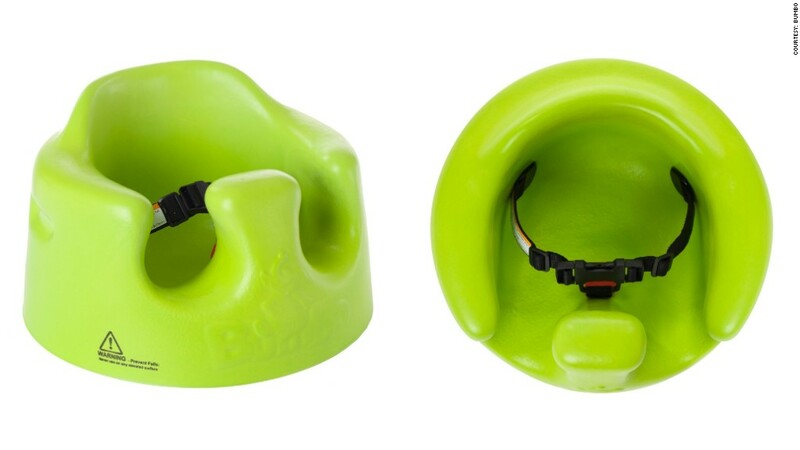 Complicating the matter, the CPSC and Bumbo International said they are aware of an additional 34 incidents since 2007 where babies were injured after they fell out or "maneuvered out" of a Bumbo seat that was being "used on the floor or at an unknown elevation." Two of those injuries resulted in skull fractures. The CPSC said the seats are sold at major retailers including Target (TGT), Wal-Mart (WMT), Sears (SHLD), Toys R Us, Babies R Us and USA Babies.